Detects 90kD proteins corresponding to the molecular mass of hsp90aß. RAW 264.7 whole cell lysate (ab7187) can be used as a positive control in WB. HeLa Cell Lysate (Heat Shocked). 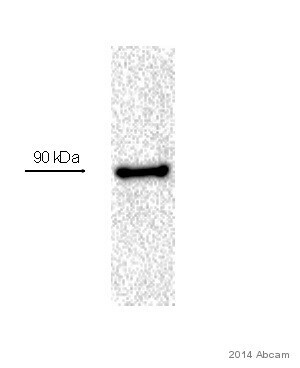 Hsp90 Protein. Our Abpromise guarantee covers the use of ab13495 in the following tested applications. WB 1/20000 - 1/40000. Detects a band of approximately 90 kDa (predicted molecular weight: 83.2 (beta) , 84.5 (alpha) kDa). Immunocytochemistry/ Immunofluorescence - Anti-Hsp90 antibody (ab13495)Image courtesy of Dr Mahesh Shivananjappa by Abreview. 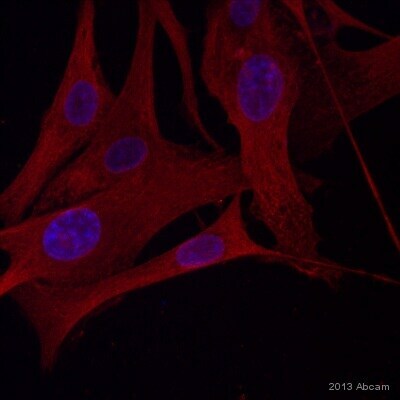 ab13495 staining Hsp90 in murine RAW 264 (ab7187).7 cells by Immunocytochemistry/ Immunofluorescence.Cells were fixed in paraformaldehyde, permeabilized using 0.1% Triton-X100 in 2% BSA for 15 minutes, blocked with 2% BSA for 1 hour at 4°C and then incubated with ab13495 at a 1/150 dilution. 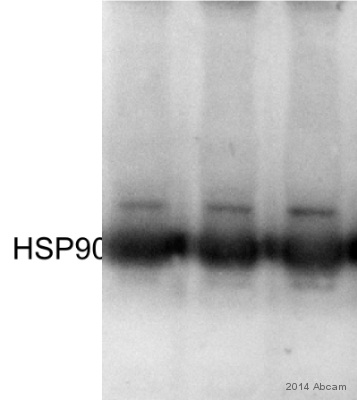 The secondary used was an Alexa-Fluor 488 conjugated chicken anti-rabbit IgG (H+L) used at a 1/500 dilution. 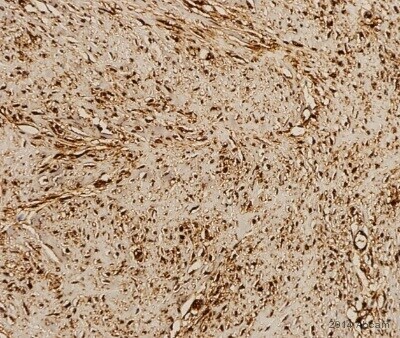 ab13495 staining Hsp90 in Mouse backskin tissue sections by Immunohistochemistry (IHC-P - paraformaldehyde-fixed, paraffin-embedded sections). Tissue was fixed with Bouin's fixative solution. Samples were incubated with primary antibody (1/100) for 1 hour at room temperature. A FITC-conjugated Goat anti-rabbit IgG polyclonal (1/50) was used as the secondary antibody. Flow Cytometry - Anti-Hsp90 antibody (ab13495)Image courtesy of Dr Mahesh Shivananjappa by Abreview. ab13495 staining Hsp90 in Human platelet cells by Flow cytometry. Cells were fixed in paraformaldehyde and permeabilized using 0.1% Triton-X-100 in 2% BSA for 15 minutes. Primary antibody used at a 1/250 dilution and incubated for 18 hours at 4°C. The secondary antibody used was an Alexa Fluor®488 conjugated chicken anti-rabbit IgG (H+L) at a 1/500 dilution. P : Permeabilized; US : Unstained, Red Peak; IgG RB : IgG Rabbit (Isotype Control) ab171870), Blue Peak; HSP90, Green peak. 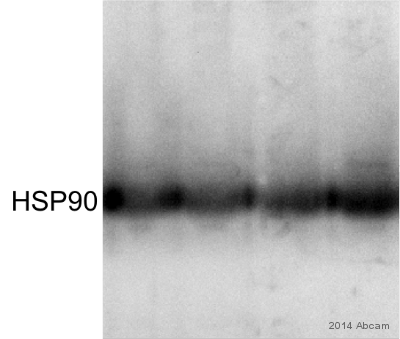 Western blot - Anti-Hsp90 antibody (ab13495)Image courtesy of Dr Mahesh Shivananjappa by Abreview. Our customer raises inquiries about our products: Anti-Hsp90 antibody (ab13495) and Anti-Hsp70 antibody [5A5] (ab2787). She would like to test in bufo bankorensis / WB. She didn’t have the protein sequences for Hsp90 and Hsp70 from bufo bankorensis. She have the HSP90 and Hsp70 gene of bufo bankorensis in text format. Please find the HSP90 and Hsp70 gene of bufo bankorensis in the attachment. The sequences provided are only truncations of the proteins and I have therefore not been able to compare them to the immunogens used to raise the antibodies ab2787 and ab13495. I cannot therefore ascertain how likely it is that the antibodies will cross react with your customers bufo bankorensis samples. I hope this has been of help. If you have any further questions, please do not hesitate to contact us again. Sorry to disturb you. Our customer raises inquiries about our products: Anti-Hsp90 antibody (ab13495) and Anti-Hsp70 antibody [5A5] (ab2787). She have the HSP90 and Hsp70 gene of bufo bankorensis. Please find the HSP90 and Hsp70 gene of bufo bankorensis in the attachment. Thank you very much for providing those sequences. In order to help the customer, could you please provide me the sequence in text format (i.e. in the body of the email, or as a word document). This will allow me to copy and paste the sequence to be able to find the protein sequence and align this to the immunogens used to raise the Hsp90 and Hsp70. This will allow me to advise the customer as to whether the antibodies are likely to be able tocross-react withthe proteins of interest or not. I have been unable to find a sequence for Hsp90 and Hsp70 in bufo bankorensis, I am therefore not able to say if the antibodies are likely to be able to detect the proteins from these samples. Would you be able to ask the customer is they have the protein sequences for Hsp90 and Hsp70from bufo bankorensis and I will check this for them. I can then let you know if the customer would be eligiblefor the testing discount scheme or not. Many thanks in advance for your assistance in this matter.